Another question we get asked here a lot at Met Consultancy Group is about whether or not we can identify live electric cables during a PAS128 survey. Although geophysics and utility surveying has the advantage of being largely non-intrusive, this does present some problems with certainty of detection and identification. I’ll start with the short answer: No, it is not always possible to guarantee identification of live electric cables during a utility detection survey. In fact, it’s not always possible to positively identify any utility. Now, what’s important to clarify here is the difference between detection and identification. 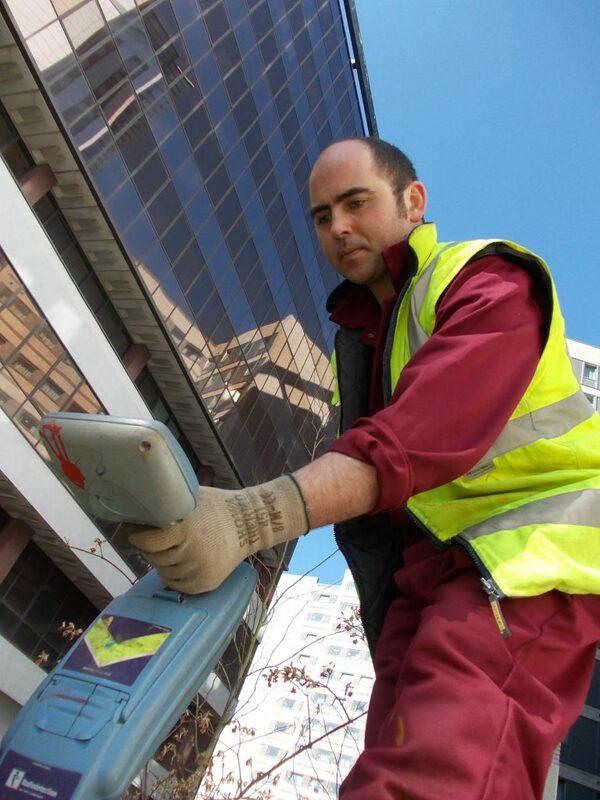 Whilst a good quality utility mapping survey might achieve a 90-95% detection rate of buried services, the positive identification of utilities is more difficult. What’s more, electric cables provide their own unique problems, as the consequences of incorrect identification or non-detection can be potentially very dangerous. To understand why it’s not always possible to identify live electric cables, we need to understand how the detection methods for utility mapping work. The most common methods used to detect utilities are electromagnetic location (EML) and ground penetrating radar (GPR). Used together for a PAS128 survey, these methods can reliably trace sub-surface utility apparatus to the specified depth of up to 3m. One technique used in utility detection is ground penetrating radar. This method transmits a pulse of energy into the ground and detects returns generated by ‘reflections’ from materials with differing physical properties. In theory, this method can detect all types of utilities – plastic, metallic, ceramic etc. however its effectiveness can be constricted by ground conditions. The size of the utility that can be detected by GPR is dictated by its depth and material composition. It’s also worth being aware that the contrasts between materials may not be sufficient to generate a detectable response in all situations. For example, if certain soil types are present such as conductive clays, or if a site has a reinforced concrete slab covering it, then this will render the technique less effective, or useless. To generate the clearest response using GPR, the instrument needs to cross a utility at rough right angles, with a feature being detected by linking together characteristic responses. I went into more detail on this in a previous blog on Orthogonal Grids in PAS128. Although GPR can detect the presence of something with reasonable accuracy, the specific utility cannot be identified using GPR alone. You will always require some other type of supporting information such as utility asset plans, associated street furniture, marker posts or similar. 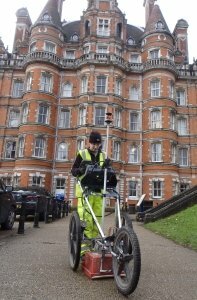 EML is a common survey companion to GPR. The technique works by using a detector to pick up electromagnetic signals being radiated from live cables or metallic utilities. In order to identify a cable or pipe carrying a live current, an EML device must be able to detect electromagnetic signals being radiated from the cables, or from an induced current along the cable (or pipe). Therefore, the utility or service must be capable of conducting an electric current (or having a signal transmitting sonde inserted into it) in order for its detection and identification to be successful. If a buried service is made wholly from non-conducting materials, such as clay, plastic and fibre optics, the cable or pipe will not be directly detected by EML at all. This is why it’s important to use GPR and EML in combination, to detect or locate all possible utilities on a site. The most reliable way of detecting and identifying an electric cable is when you can directly connect to the cable and induce a signal along it. The most common ways of doing are usually from an inspection chamber, an item of street furniture (such as a street light), from clamping directly to cables either exposed in the ground or at substations (ensure anyone entering a substation is correctly qualified and authorized to do so) or by plugging in to an electric circuit using special adaptors. Using these techniques will generally provide the highest confidence that the cable you are locating is the one that you want – there are also techniques that can (and should) be employed that will tell you when the signal becomes less reliable or if it has ‘jumped’ from the cable of interest to another nearby conductor. It is also possible to identify electric cables without directly connecting to the utility, by picking up re-radiated signals in the ground. These are the signals that are also detected by simple cable avoidance tools (C.A.Ts). To locate these signals, we use an EML in one of its passive modes. The most common modes used are ‘Power’ and ‘Radio’. Radio – detects signals re-radiated from metal utilities acting as a conductor for ambient VLF (Very Low Frequency) radio waves. It is often thought that ‘Power’ mode detects live electrical cables, and whilst this is partly true, it is not the whole story. Other types of pipes/cables can also exhibit similar signals to electric cables, so a positive identification of a signal specifically as an electrical cable is not always possible, unless there is some other kind of supporting evidence. Even though electrical cables may have a current flowing through them, if they are well balanced* (which they are engineered to be), they can be difficult to find either by direct connection or with locators using the passive ‘power’ modes. Electrical cables that are ‘Pot ended’ are difficult to find because they do not carry current even though they are under voltage. As they are usually short in length they are often not long enough to act as an antenna for re-radiating radio waves and are therefore almost invisible to normal detection methods. If cables are not ‘earthed’ at both ends they might not be detected. Supplies to buildings using protective multiple earthing (PME) systems can also be tricky to find. It is important to note that ‘Radio’ signals can fluctuate in strength; therefore a signal that is detected one day may not be detectable on another. It is rarely possible to positively identify a cable detected by indirect methods as either being ‘live’ or ‘dead’. Any utility found should always be treated as ‘live’ until confirmation is received from the asset owner that the service is redundant. In essence, although there are many ways of detecting utility features, it is often harder to ascribe positive identifications of the specific utility. What’s more, even when a cable is identified, it could be subject to ‘signal jump’, whereby signals can jump from a cable being traced to another pipe or cable in close proximity if it offers a better route to earth. There are methods that can help detect this happening, but they are not always applicable. Therefore, mis-identifications should always be considered a possibility. When working on a site where possible hazards exist, such as live HV cables or high pressure gas, the appropriate safe digging techniques should always be employed. Even where a pipe or cable has been identified on a plan, care should be taken due to the possibility of mis-identifications occurring. A good utility survey should only depict a utility as a specific service where there is good evidence and reasons for doing so. This then means that you can have confidence that a utility which has been located and identified on a drawing as an electric cable is highly likely to be an electric cable. However, the mitigating factors around the mis-identification of other utilities means that any utility, especially unidentified ones, or those identified by power or radio (indirect methods) should always be considered as possible hazards such as live HV cables. A drawing showing the results of a utility detection survey should never be treated as being the whole truth or 100% correct. The results of a utility detection survey can vastly reduce the risk of excavations on site, however the methods employed, like any other tools, have their limitations and this should always be at the forefront of anyone’s mind when digging on sites with potentially lethal services present. The accurate identification of features by EML and GPR depends on the knowledge and experience of the project personnel. Met Consultancy Group employ experienced, qualified staff to conduct our clients survey work as rigorously as possible. Sam Roberts, Director at Met Consultancy Group, consulted on the PAS128 specification prior to publication, and leads our geophysics and utility mapping team in the provision of PAS128 surveys. To speak to one of the team about how we can help your project, call 0113 200 8900 or complete our online contact form.